Native Instruments has unveiled Drum Lab, a new sample-focused drum designer instrument for Kontakt 5 and the free Kontakt 5 Player. Drum Lab is built around the idea of layering together a combination of acoustic and electronic drum samples. The application features an 'acoustic layer' with 38 different recorded drum sounds, each of which has sampled in a choice of three different rooms and appropriately processed. The software instrument's 'electronic layer', meanwhile, features 380 drum hits sampled from a host of vintage and modern drum machines. These have been, according to NI, "expertly matched, phase aligned, faded, and pitched" in order to blend seamlessly with the acoustic samples. The interface features sliders for precise blending of layered samples, along with an effects section and a host of pre-recorded MIDI drum patterns. 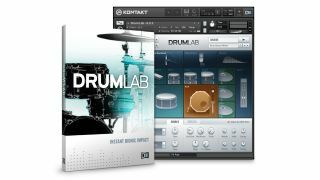 Drum Lab is available from the NI Online Shop for $99/99€. Check out the press release below for more info. Native Instruments today released Drum Lab, a first-of-its-kind instrument combining advanced drum layering techniques with an intuitive workflow designed for fast results. Drum Lab's combination of acoustic and electronic drum samples is the secret of professionals worldwide - a powerful production technique for creating punchy, present drum tracks. An included groove library provides over 900 patterns for fast groove production with uncompromising sound quality. Drum Lab combines the organic, expressive sound of acoustic drums with the weight and punch of electronic samples. This 'hybrid' layering technique is the secret weapon of countless industry professionals to give drums presence and clarity in sonically dense mixes. Drum Lab's acoustic layer comprises 38 carefully chosen individual drums. Each was recorded in three different rooms with high-end vintage and modern equipment on analog tape. The drums are pre-processed for instant, professional sound and feature all the warmth and subtly acoustic drums bring to top-quality recordings. What sets Drum Lab apart from other software-based drum instruments is its electronic component: 380 drum hits were sampled from a range of classic and modern drum machines, then expertly matched, phase aligned, faded, and pitched to perfectly blend with the acoustic samples. This crucial step saves producers hours of time, allowing them to focus on their music. Drum Lab's clear interface provides all necessary sound shaping controls directly on the front panel. Producers can choose individual acoustic and electronic layers, blend them to taste via a convenient slider, and quickly adjust fine details with some of Native Instruments' most sought-after studio effects. A streamlined set of controls for Transient Master, Solid EQ, G Comp, an optimized drum compressor, and a rich convolution reverb are all located on Drum Lab's main panel, allowing quick and easy sonic adjustments. Users can dial in a variety of sounds from detailed and rich to saturated and gritty without spending unnecessary time switching through multiple page menus or negotiating complex effect parameters. This creates an intuitive way to create completely individual drum sounds. Alongside its extensive sound shaping possibilities, Drum Lab also delivers authentic performances. A new set of patterns were recorded by a professional drummer, then converted to MIDI files and arranged by genre in Drum Lab's groove library. Users can quickly drag-and-drop these patterns into their sessions, accelerating production time without sacrificing human feel. A unique visual display lets producers see where grooves line up in their tracks for added visual reference when creating beats.